I used to work at Maximum Performance in Neenah as the head service tech and was starting to compete in BMX freestyle. Back then, we had a pretty equal balance of the most popular bicycles and fitness items. Years later, I worked at the original Recyclist shop which handled new & used bikes and parts. Most recently, I managed a 2nd Wind Exercise equipment store… and I missed the bicycle industry. My dream was to have a mixed offering of good quality new & used bikes, bike parts, fitness equipment and fitness parts. Offer service on bikes & fitness equipment as well. I’ve always had a knack for good customer service and building good customer relationships. Putting my strengths and experiences in service, retail & BMX together in a new shop, my family and I started Active Bike & Fitness LLC. A new customer can walk in for the first time and be surprised at the unique variety. They have options to shop for new or used goods in just about any category. New & used bicycle tires, refurbished or brand new bicycle, new & used small parts, new and used exercise equipment. Marin Bicycles (of Marin County California) is the premier bike brand we carry. 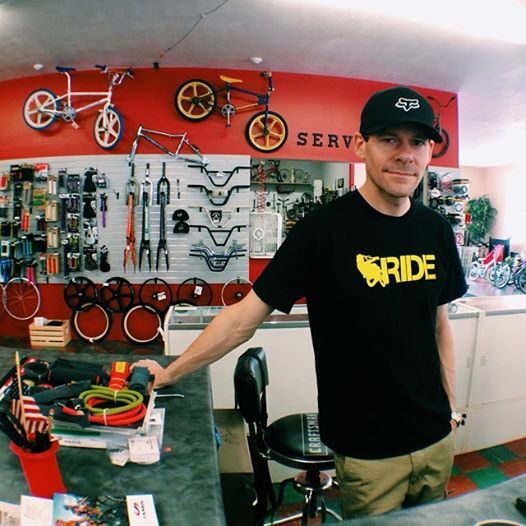 Slogan: “Building the best mountain bikes, commuter bikes, road bikes and cyclocross bike since 1986.” Other brands we carry are GT Bicycles, Surly Bikes, Tunturi Fitness, DecoBMX, StolenBMX, Subrosa BMX, We The People BMX & more… Overall, I try to have a vast variety of affordable used, refurbished & new items to suit more people’s needs. When something needs to be repaired, we have a very high success rate at affordable prices. BMX is my passion. These days in my free time you can find me riding at a local indoor or outdoor skatepark with friends, still throwing down some pretty serious tricks. I’ve been riding BMX since age 13. Along the way I’ve been a stunt show rider jumping ramps at events, festivals, school assemblies and other gatherings. I’ve entered competitions in various parts of the country and done pretty well… have a few trophies on the shelf at the shop. I am a co-founding member of BACO Designs www.bacodesigns.com trick team. Together with Chris Rye propsbmx.com , Chad DeGroot decobmx.com , Dave Friemuth, Brian Kachinsky a GT Pro and Mark Hilson, we put our hilarious antics and riding into video production. The summer of 2014, Rye released all 10 old BACO videos on one Blue Ray disc along with the new Push it to 11. A documentary of the entire journey that I am happy to be a part of… even if it’s only a small part. (Viewers, parental guidance strongly suggested) What started as a group of friends involved in BMX from Appleton and Green Bay shooting videos, has grown to reach BMX riders all over the world. One of the video premiers where we recently reunited was in Appleton.